It is with a broken heart I tell you that our deaf boxer Nitro passed away on Monday 11/05/18 surrounded by his family of humans and dogs. He had been diagnosed with lymphoma less than a month earlier. Above photo: Taken by our friend Kenn Bell with The Dog Files. Kenn came to see Nitro one last time and this photo was taken about a week before Nitro passed away. Thank you Kenn for caring enough about Nitro and his mama to come and stay here at DDR HQ and photograph our family. Nitro leaves behind a legacy of love with families and their deaf dogs around the globe. He is the reason why Deaf Dogs Rock was launched in August 2011 so that we could help deaf dogs just like Nitro make it out of shelters alive and into partner rescues. 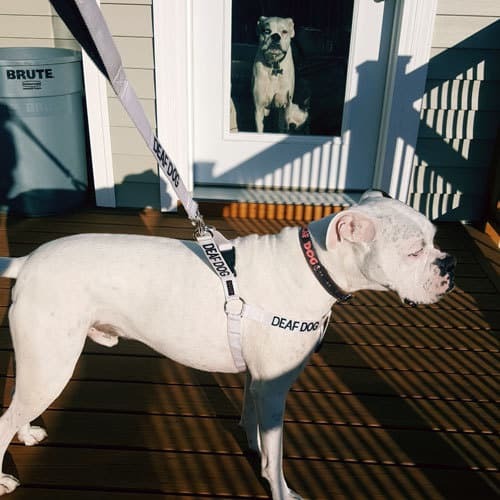 He is the reason why we have a deaf dog training blog, an adoptable deaf dogs section and our Deaf Dogs Rock Wall of Fame so everyone can see that deaf dogs are worth saving. He is the reason why so many have read his story and decided to move forward with adopting a deaf dog or puppy. Even a hundred years with Nitro would not been enough time for us but we are blessed that God entrusted us with him for 8 short years. We cherished every single day he was here with us on this Earth. When people read his story they realize all of us are scared when we adopt a deaf puppy but with a thankful heart, a commitment to training and socialization, living with a deaf dog or four deaf dogs in our case can be very rewarding. Chris and I knew we didn’t have a lot of time left with our sweet Nitro so we made every single day count. We home-cooked meals for Nitro so he could keep his strength up, we took him to see people who loved him, and we made a lot of trips to McDonald’s so he could have a few of his favorite yummy hamburgers. Photo above: My sweet Nitro a week before he passed away begging me for a treat. He was so intense when it came to eating because his medication made him hungry. Above: Our dear friend Waynette came over and spent a lot of time with Nitro. He was so happy to see her. He totally gave her wet slobbery kisses and as you can see from the first photos when she gave him a hug he was smiling! Above: Our friends Katy and Rusty came by to see Nitro while he was still feeling good and mobile. Above: We took Nitro to see our friend Laura Bair at Roanoke College so she could see him one last time. He was so happy when she climbed in the van at lunch time to hang out with him. Above: Rebecca Custer, the shelter director who brought Nitro into our life and is on our Deaf Dogs Rock Board of Directors, came to see Nitro on his final day on this earth. Later that day he was unable to walk or get up. Nitro was so excited to see her! Above: We ran into Salem to see our friend Kim Frank so she could say hi to Nitro. He was all slobbery kisses for her. Above: Just a week before Nitro passed away, our friend Kenn Bell came up from Florida to spend the day with us and take some photos. Kenn is with the Dog Files and we are so thankful to him for taking some great family photos with Nitro surrounded by his loved ones, Now we will have some beautiful photos of our final days with him that we can share with family and friends. Above: Kenn took this beautiful family photo while he was here on the farm. In this photo is Chris, myself, and our four deaf dogs Cornell, Bowie, Bud and Nitro. There won’t be one single day that goes by that our hearts won’t miss Nitro’s presence, but his legacy will continue through our work here at Deaf Dogs Rock. We will continue to bring awareness to how much deaf dogs rock, we will continue to educate people about deaf dogs, we will continue to raise money so we can sponsor deaf dogs out of kill shelters into the safe harbors of rescue, we will continue to list deaf dogs available for adoption around the country, and we will continue to give deaf dog caregivers and fosters the tools they need to carefully screen new potential homes while trying to re-home a deaf dog listed on our website. Above: Kenn took this photos of Nitro and I out in our front field which was Nitro’s happy place. this is the last photo ever taken of our sweet boy. We want to thank all of you for your prayers, your kind words of encouragement, your friendship, and your financial support. We will never forget your kindness and we will never ever forget our precious shelter boxer Nitro. He will always be our hero dog. To read more about Nitro’s beginnings and his journey please see our post Nitro’s Story.